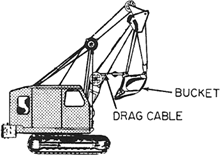 An excavator fitted with a hinged arm to which is rigidly attached a bucket that is drawn toward the machine in operation. Also known as backacter; backdigger; dragshovel; pullshovel. An excavating machine for cutting trenches; a boom-mounted bucket moves toward the machine, cutting the ground like a hoe; then the machine turns away from the cut to permit the operator to dump the soil. Customers can expect increased productivity with an improved operator environment, better fuel efficiency and more reliability from the new range of backhoe loaders. The durability and versatility of Cat's backhoe loader enables it to be the suitable machine for various applications to meet different project requirements and demand. This launch was a great opportunity for our customers to experience first-hand the benefits of our new tractor backhoe loader and also to share information about their personal experiences with our company and the excellent after-sales service offered by our dealership," said Franco Invernizzi, senior business director for the Middle East at CNH Industrial Construction Equipment, the owners of the Case brand. In terms of geography, Asia Pacific dominates the global backhoe loader market, followed by North America and Europe. Arun Kumar, sales manager at Motorcity-Commercial, the distributor of Hyundai Heavy Industries in Bahrain, said: "We are launching the new Hyundai Backhoe Loader to support construction projects with a more powerful and aggressive all-rounder performer. The launch of new Backhoe loader series is expected to add to this contribution. Last December JCB marked the production of its half millionth backhoe loader and this year celebrates the 60th anniversary of the production of the first JCB backhoe by company founder Joseph Cyril Bamford. Despite the maturity of the backhoe loader, it is still one of the world's biggest selling pieces of construction machinery. JCB's 3DX Backhoe Loader, the new generation machine is powered by the JCB ecoMAX engine which is a purpose built in house 76 hp engine which is big on fuel savings and high on performance with 16 valve effort; has a twin ram steering for easy steer ability. Robert Droogleever, BHL General Manager, said "Our new facility is a testimony to the growing importance that India as a market commands in our global Backhoe Loader business strategy today. The three new models in the Cat[R] F Series Backhoe Loader range--416F, 420F and 430F--are center-pivot machines featuring significant design enhancements, including a new Cat C4. Birmingham Metropolitan College is working in collaboration with construction and mining equipment maker, Caterpillar, to recruit apprentices to meet the production demand for their backhoe loader product line.